During the Spanish Civil War the air raids on Barcelona damaged and destroyed 1808 buidings, mainly apartment blocks. Nothing in comparison to the Blitz or Dresden. But in Spain they were just beginning. The photo above is not a bomb site from the civil war. Though it looks just like one. It is Miles de Viviendas (Thousands of Houses). An abandoned building occupied two years ago by a group of young people, mainly musicians and clowns and sundry performers, who made it their home and social centre. Early yesterday morning they were evicted without warning and demolition began immediately. 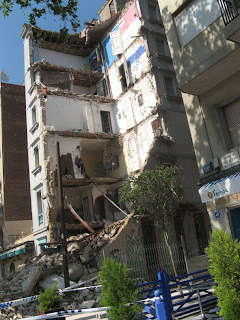 So immediately, most normal safety precautions were forgotten in the rush to prepare the site for whatever avaricious real estate dream the owners, the Port Authorites of Barcelona, have in mind. But these young people also have a dream. I know they will not be disheartened.